A frantic rush to the finish continues. To complete the 48V motor circuit, I had to make a few more cuts. I have found that grouping tasks such as cutting with the Dremil saves time. I found I had to trim the battery tray lip in the rear to allow the #4 wires to be passed under the vehicle. On the left, wires go from the reversing switch to the controller. Also, the brake line goes through that lip too. Smaller circle shows the brake cable. Larger circle passes 48V lines. On the right, one cable will be passing from under the speed controller, up , to go to the negative battery terminal in the battery tray. I also did some cuts on the rear fender. One is for the reversing switch handle so it doesn't need to be taken off every time I need to lift the fender. At this point, I've put on and taken off the fender several times. Since the switch has dragged on the inside of the fender several times, it has managed to mark a path of it's travel inside the fender. So, now I know where and how wide the notch should be. Notch is cut, then switch handle is attached. Note, switch handle didn't come with a screw. I happened to have one. Size and TPI will be noted later. Two other Dremil operations are for the battery cutoff switch and the charging port. I put the holes towards the front on either side, but behind the glove box indentation so wires would be in no danger of hitting battery terminals. To trace a circle, I used a coin on the inside to serve as a guide for my Dremil cut. Then, I smoothed the cut while widening it with a Dremil drum sander tool. Nice fit! Now, I have screwed on the fender for the final time (yea, right). Then, the batteries go in, one by one. Once the switch and port are mounted, their wires are pushed out of the way. They will be attached later. At first, I wondered about why there was a space left between the battery packs. Once I took off the temporary handles from the batteries, I found out why the extra space around the batteries is important. If not loaded correctly, the batteries are in the perfect position to pinch fingers! After loading the batteries, the space between is a perfect fit for a 2x4 piece of wood. After slipping in the wood, the batteries seem to be rather secure. Nice design! 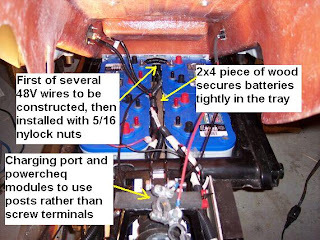 After the batteries are installed, the remaining 48V cables are constructed. The process is the same as it was when I put the reversing switch on. Sit next to the car, measure a run, cut cable, strip end, crimp end, wrap end in tape, put split tube on outside, wrap split tube. Sounds like a bit of work but it goes quickly. I found wearing nitrol gloves, with cloth gloves on only keeps my hands warm but also keeps my fingers free of little copper metal bits! I am putting wire wrap on all the wires I can in the battery tray. I may be a bit paranoid but I really don't want something shorting against something else. The wire sections are connected to the battery posts VERY tightly with 5/16" nylock nuts rather than the wing nuts that came with the Optima batteries. I'm not sure if split tubing is really needed around all the cables for protection but I'm putting it on just in case. The only really difficult wires to attach were the final wires to connect to the battery pack. I needed to drop the controller shelf so I could attach the large #4 wire to be connected to the battery. Fortunately, this is held on by two bolts which are rather easy to get at. Then, attach all wires tightly and lift the shelf back up. I'm not attaching the positive and negative cables to the 48V motor circuit yet. First, it's time for a final 12V circuit test. - tail light, signal lights, low beam all work. - horn didn't - (traced to a lose spade connector). - brake light spring is just a little bit too tight. This was fixed by stretching spring. I also decided to solder the brake indicator connectors rather than rely on crimps. Since I have attached & detached the brake indicator connector several times, I am really glad I spent an extra $2 to put on a quick-disconnect for that little piece of the wiring! - lo-hi beam indicator lights on speedometer are reversed (purple colors are very close to each other, so this is understandable and can be fixed later). - hi-beam is dim. Monitoring the Yahoo group shows more than one person has had this problem. However, since this is not critical for the 48V test, I'm going to press ahead with the 48V test. Block front wheels so they cannot move. do low speed 48V forward & backward test. Now, this is a big test, with big wires that can unleash the full power of the battery pack. Safety glasses, no wrist watch or rings and the one-hand rule are used when connecting wires. First, the contactor and DC-DC converter wires are attached to the battery cutoff switch. The charging wires are attached to the positive and negative posts on the battery. The 48V meter reads that the pack is full. The negative DC traction motor wire is attached to the pack's terminal along with the DC-DC converter feed wire using a nylock. The positive DC traction wire (via fuse) is then attached along with the other DC-DC converter feed wire. No spark. This seems good. Finally, the big moment. Things will either work, not work or smoke. I turned the switch & the contactor clicked. 12V lighting works. Good. Now, gently push on the throttle..... nothing. Tracing out the wires, I found the key switch spade connector was detached when the controller was dropped to attach the large power wire. This was re-connected. Try the key again. Just touch the thumb throttle ... success! Due to the chain drive, it's not as quiet as I expected, but it's much quieter than a regular motorcycle! Then reverse was tried. Success again! It's been a big night. I think a small test drive is really close to happening! - Put in a spacing washer for the parking brake so the handle can lock. - screwed on the front door. Still need to hot glue a better seal around the door. - put in a wood stick for propping up rear fender when servicing the BugE. Also need a way to prop up the cowl too. Make cowl wiring neater - give some thought to a dashboard. Arrange to transport to/from an inspection station. 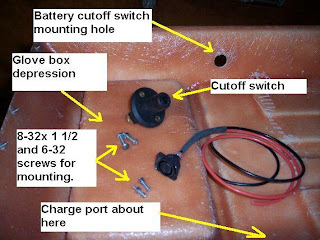 -design and install a dashboard console to include a car radio & rocker switches for accessories. -If storing outside in cycle shelter, would a small heater (such as a light bulb) to eliminate condensation from electronics and bubble be needed? Installing seat isn't mentioned in the tasks. However, for servicing, then driving, then servicing again, having a seat that easily slides on and off is REALLY NICE. Also, I put in a better keyswitch in series with the battery cutoff switch. This allows lights to operate when the BugE is exhibited but the motor contactor will not be ON without the secondary switch being ON too. First test drive! Feb 22, 2009!